Organize your conference notes with notebooks and tags. Include photos directly into your session notes. Evernote automatically adds the date and location! A to-do list note for every day of the week. Shared shopping lists with my significant other, using the Premium version (I firmly believe in supporting products I use regularly. It’s well worth the $45 per year; that’s $3.75 a month, kids, less than two cups of Starbucks coffee). Automatically saving things to a note in conjunction with If This Then That (IFTTT). 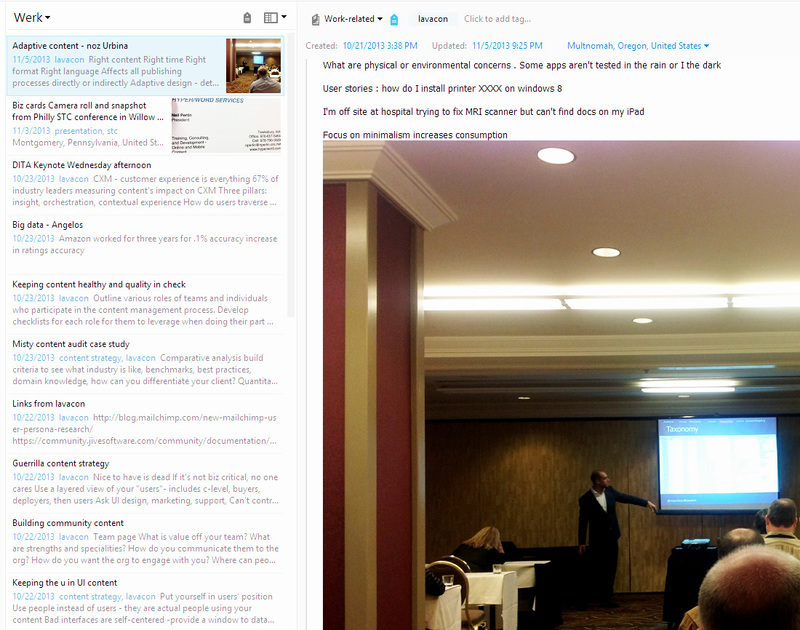 But there’s one more possibly overlooked use for Evernote that I find invaluable: conferences. I attended three conferences this year, including the Drupal NYCCamp and the huge Lavacon conference (see my Lavacon-related posts here and here), with nothing more than an iPad.